Searchers have located a small fixed wing aircraft that disappeared from air traffic controller contact last night on the Debub Peninsula of Jefferson County. Using radar forensics data and the plane's emergency locator transmitter, search crews were able to find the aircraft in a heavily wooded ravine this morning. Four occupants have been located in the wreckage but there were no survivors. The names will not be released until they have been positively identified and their families have been notified. Release of names will come from law enforcement and coroner's office officials. Jefferson County Sheriff's Office is now the lead agency and can be reached at 360-344-9747. As of midmorning, search crews are still working through the difficult scene to recover the victims. The Federal Aviation Administration and National Transportation Safety Board investigators will arrive on scene Saturday morning to examine the aircraft. Participants in the mission are from Jefferson County Search & Rescue, Jefferson County Sheriff's Office, WSDOT, Civil Air Patrol, US Navy, Washington Emergency Management Division, Quilcene Fire District 2, Port Ludlow Fire District 3. The plane, a single-engine Cessna, departed Seattle's Boeing Field just after 6 p.m. on Thursday, Dec. 29, bound for Port Angeles. Air traffic control lost contact with the plane at 6:44 p.m. in the general area of Dabob Bay. Emergency locator signals were used to define the search area. WSDOT is coordinating a search for a private plane reported missing near the Dabob Bay area of northern Hood Canal Thursday night. The plane left Seattle's Boeing Field headed for Port Angeles just after 6 p.m. Thursday, Dec. 29, and lost contact with air traffic control about 6:44 p.m. near the Dabob Bay area, east of Quilcene. The Federal Aviation Administration then contacted WSDOT, which is charged with all aerial search and rescue within the state. A ground search is underway by the Jefferson County Sheriff's Office and a U.S. Navy helicopter also joined the search Thursday night before poor visibility called off the air search. A fixed-wing Civil Air Patrol plane will join the search at daybreak. The WSDOT Air Support Team also is working to track the airplane's emergency locator signal. Further details about the plane, the pilot or any occupants are not being released at this time. Updates on the search will be posted here as they become available. As 2016 comes to an end, it's a perfect time to look back at what we accomplished during the busy summer and fall construction seasons. We know it's never easy when we close lanes to get work done, and we couldn't do it without your patience and understanding so a sincere thanks for your cooperation. Those few months with predictable dry weather is often the only times we can do some of this work but the payoff is improvements to our highway system for everyone. In the "#SnoCoSqueeze," we replaced 41 aging expansion joints on the Interstate 5 bridges between Everett and Marysville. With an expected lifespan of up to 25 years, the new expansion joints improve the safety of these bridges for motorists. 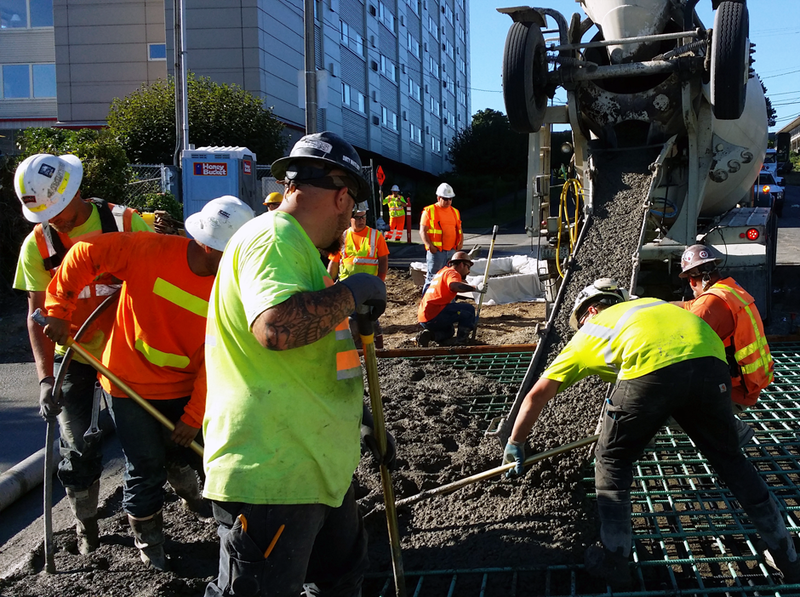 The first phase of the "#SouthKingSlowdown" work to rehabilitate more than 13 miles of southbound I-5 between Tukwila and Federal Way was completed during five weekends of lane reductions. Crews repaved nearly three miles of the roadway, replaced hundreds of concrete panels and replaced expansion joints. The work continues into 2017. In Tacoma, we made good progress on the two HOV projects, including opening the new Pacific Avenue overpass spanning I-5 and beginning demolition of the McKinley Way overpass. Crews also continued our environmental cleanup work by removing a concrete-lined vault of petroleum-contaminated soil as part of our HOV project work. The vault was from the original Interstate 705 construction and its removal continued work that began in 2013 when two other vaults were removed. 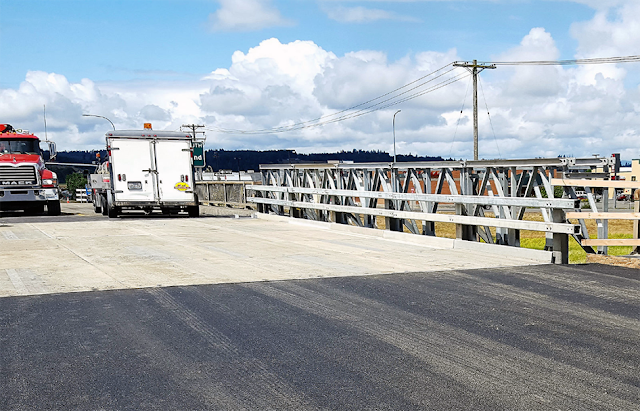 Less than two weeks after the Chamber Way overpass in Chehalis was severely damaged by an oversized load and closed to traffic, we reopened the road using a temporary bridge. Work on the permanent replacement begins next year. temporary bridge as the overpass was severely damaged by an oversized load. As part of the project to improve a 15-mile section of Interstate 90 from Hyak to Easton over Snoqualmie Pass, crews finished one of two new avalanche bridges in early August. This elevated bridge should reduce the number of times the road is closed for avalanche prevention work. Crews also completed the first arch of the wildlife overcrossing across I-90. Painting of the Vantage Bridge – which protects and preserves the 52-year-old structure – also was completed this summer and fall. The bridge carries an average of 14,000 vehicles a day and is a vital part of the I-90 corridor. 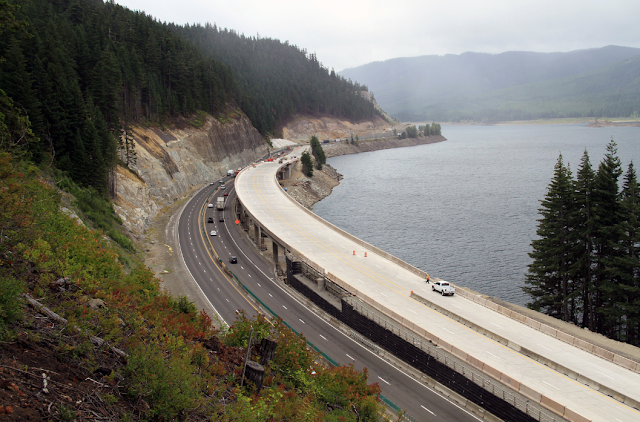 We replaced deteriorating concrete and asphalt along three miles of westbound I-90 lanes near Cle Elum. The new I-90 westbound Freya Street off-ramp in Spokane also opened to traffic, helping to solve congestion and air quality problems from idling vehicles. The new off-ramp creates a more efficient intersection. reducing the need to close the highway for avalanche prevention work. We're continuing work to replace some of the oldest vessels in the fleet. The third Olympic Class vessel, Chimacum, was christened in September and is nearing completion. The keel laying for the fourth vessel, the Suquamish, took place in May and is now about 30 percent complete. Decades old terminals got some much needed updates and improvements. At Coupeville, seismic upgrades were made on the structures that raise and lower the moveable bridge between the ferry and the dock. The terminal dock at Vashon also received upgrades to better withstand earthquakes, and safety improvements were made for passengers who arrive by bus, as well as for those with disabilities. Progress is being made on multimodal projects that will result in more seamless connections between transit, ferry and other modes of transportation. 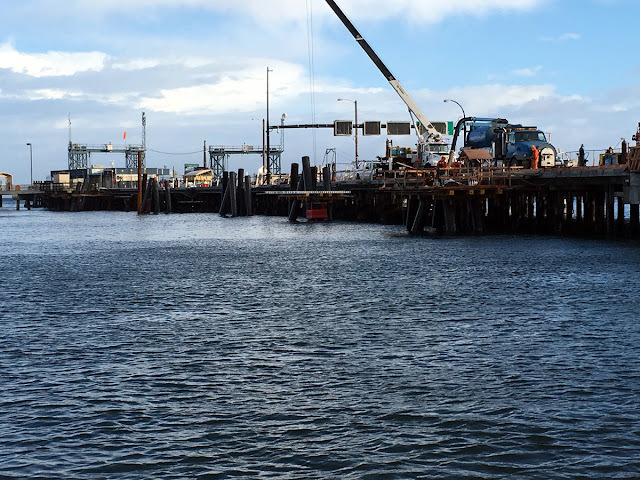 At Mukilteo, the first stage of prep work for the terminal replacement at a former tank farm site was completed. And final design and pre-construction work for the Seattle Multimodal Terminal at Colman Dock means we'll be ready to start construction in spring 2017. 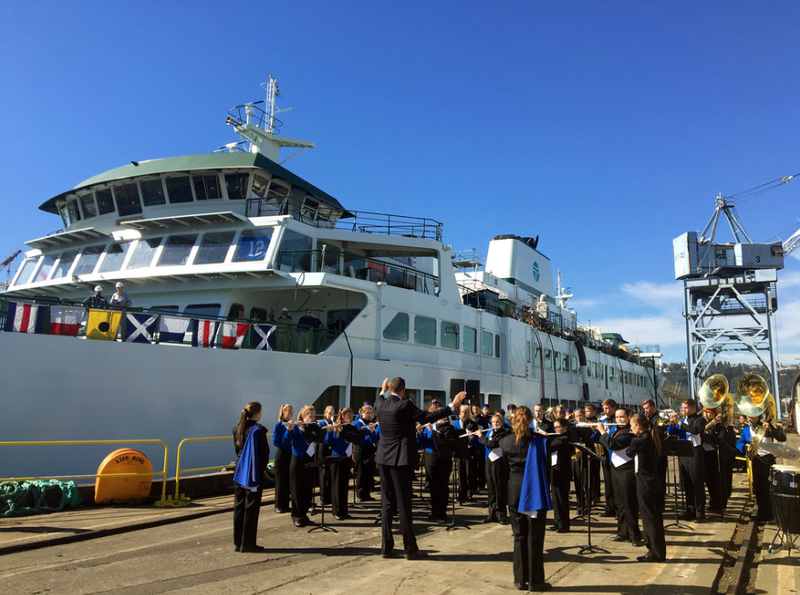 We celebrated the christening of the Chimacum, our third Olympic Class ferry, in September. Crews also repaved more than 50 total miles of several highways from South King County all the way north to Blaine. Drivers will benefit from a smoother driving surface, fewer potholes and cracks and fresh reflective striping. Crews completed paving projects on I-5 through Tacoma as well as on both the SR 16 Tacoma Narrows Bridges. Crews paved a total of 39 miles of road on several highways in Lewis, Clark and Klickitat counties and chip sealed 63.5 total miles of roadway in Clark, Cowlitz and Wahkiakum counties. More than 20 miles of roadway on four highways near the Tri-Cities were repaved. We rehabilitated bridge decks on seven of the 11 bridges on State Route 153 between Pateros and Twisp in Okanogan County, removing and replacing the asphalt overlay, waterproof membrane and expansion joints. Crews used chip seal to resurface 43 miles of highway in Chelan, Douglas and Grant counties. Crews installed centerline and shoulder rumble strips, sealed pavement and replaced plastic pavement markings on six highways in the north central part of the state, including US 2 and State Route 20. Crews worked hard to get the new Pacific Avenue overpass in Tacoma opened this summer. Crews replaced one culvert on SR 532 near Stanwood that blocked fish passage and work is underway on two more projects to eliminate fish barriers. We removed 11 culverts or other fish barriers across state highways in Pierce, Thurston, Mason, Kitsap and Clallam counties, providing miles of new fish habitat and easier access for underwater creatures. Some projects required total highway closures to allow crews access to the work site. 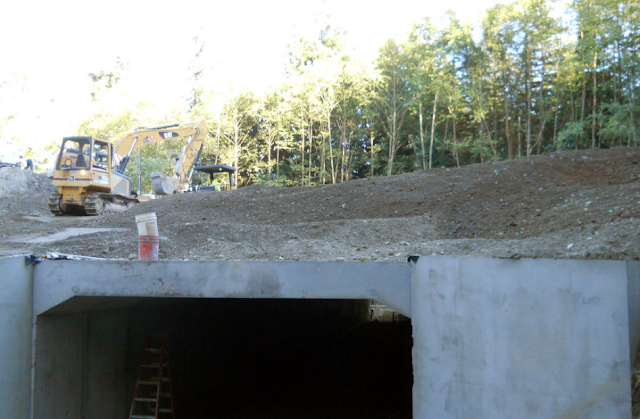 In Whatcom County, we also finished up work on a fish passage improvement project on High Creek at State Route 542. A new, and much-larger, fish culvert opened on SR 532 near Stanwood, greatly improving the habitat in the area. Several sections of US 12 on White Pass damaged in December were repaired between mileposts 141 and 165. Repairs included a retaining wall, drainage restoration, traffic barriers and repaving. The Pilchuck River is no longer threatening to take out SR 92 west of Granite Falls. The riverbank has been crumbling away for many years. It's taken out a house and several outbuildings. Crews stabilized the riverbank by rebuilding it and reinforcing it with 30 foot logs chained to huge boulders embedded in the river bed and new plantings. A roundabout was installed at the SR 224/225 intersections in Benton City, with crews also adding a park and ride lot and improved lighting and sidewalks. This is the first of two phases of the Red Mountain Interchange Improvements. In the Spokane area, we constructed a new roundabout at the intersection of Wellesley Avenue and Freya Street in northeast Spokane. The roundabout replaces stop signs at this busy intersection and widens both streets, providing more efficient travel through the area, especially for large trucks traveling to and from nearby industrial and distribution businesses. We rebuilt and stabilized the riverbank of the Pilchuck River, which was threatening to take out SR 92 near Granite Falls. Our major work is done for this year but crews are already planning for another round of construction and preservation projects in the summer and fall of 2017. We'll spend the next few months prepping for that work to be ready during the dry construction-friendly weather window. We look forward to making even more improvements for the traveling public and, as always, thank drivers for their patience and understanding during the process. Update Dec. 29, 3:00 p.m. : The repairs are taking longer than expected and we hope to have it reopened by the 31st. Just a few minutes before the ferry was set to leave Point Defiance dock Christmas Eve the captain of the M/V Chetzemoka suffered a major medical emergency and collapsed onto the control panel. The accident caused the ferry to pull away from the terminal while it was still attached to the articulated ramp at the end of the dock. 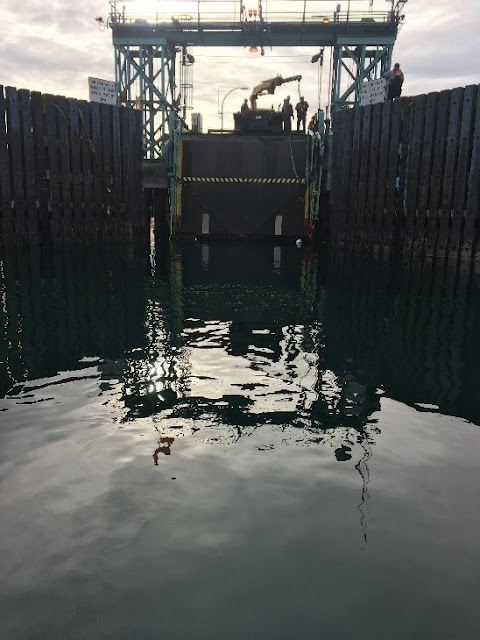 As a result, the ramp, also known as the dock apron, was damaged and service was immediately suspended on the route connecting Point Defiance (near Tacoma, WA) with Tahlequah on Vashon Island. Point Defiance dock prior to the damage that occurred on Saturday, Dec. 24, 2016. The vessel crew quickly regained control of the ferry and rendered critical first aid to the captain until an ambulance arrived. The captain is OK and expected to recover. Our crews worked until late Christmas Eve to assess the damage and ensure the safety of the dock. They found significant damage to the dock apron (hanging vertically in the water). We were hoping repairs would be complete by now, but workers were unable to get some of the required parts and equipment delivered over the holiday. We estimate the dock will remain out of service until December 30 December 31, while crews complete repairs. A floating crane arrived on scene today allowing crews to remove the apron and complete repairs to damaged dock components. 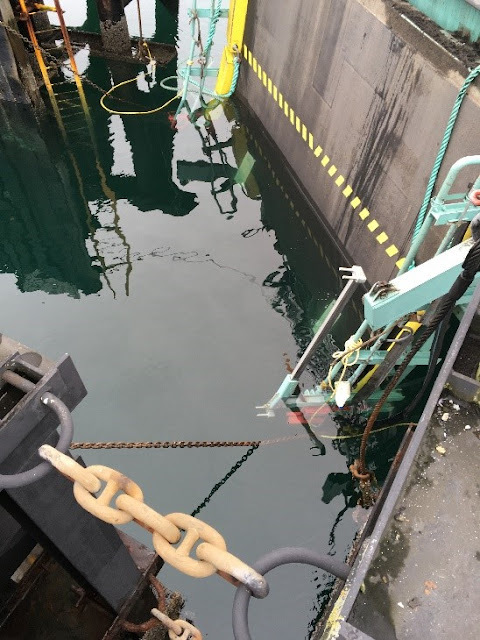 This work requires close coordination between WSF’s terminal engineering staff, Eagle Harbor welding specialists, and outside contractors to provide the crane lift and inspect our weld work for safety. We continue to provide updates to customers to ensure they are aware of this continuing service outage, and are working as quickly as possible to restore the dock to safe operating condition. Thank you for your patience during this service disruption. Will we see snow, or won't we? Forecasting weather is tough, but preparing for a storm or hazardous traveling conditions isn't. 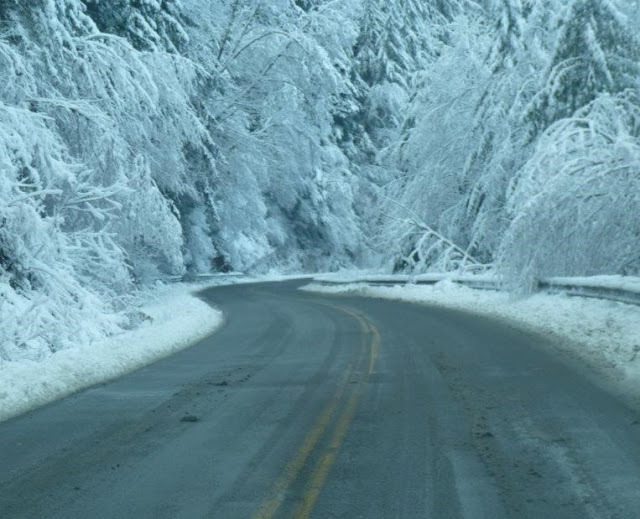 Whether flakes fall or not, it's often cold enough during winter months for ice to form and create slick roads. While our crews treat roads 24/7 during colder months, that doesn't mean there won't be areas where ice has formed and travel is tough. Deicer salt also doesn't work when temperatures are under 20 degrees. So we count on drivers to do their part. Ice can be expected on all roads this time of year, so drivers should slow down in hazardous conditions. Slow down and drive for conditions. Increase your stopping and following distances. If you're pulling into traffic, be sure there's enough room to get up to speed and to allow others to slow down while you merge. Pay attention to and abide by traction requirements. Be sure your vehicle is prepared (pdf 1 mb) for winter travel. Be extra cautious on ramps, bridges and overpasses, which tend to freeze first. Give snowplows and other large vehicles extra room. Drive to your abilities. If you don't feel safe driving during hazardous weather, make the right decision for you. Know before you go. Check forecasts and road conditions before heading out. When snow/ice is on the ground, give snowplows and other large vehicles plenty of room. In the event of a major storm affecting state highways, we have a number of resources available to keep people informed of conditions and road closures. 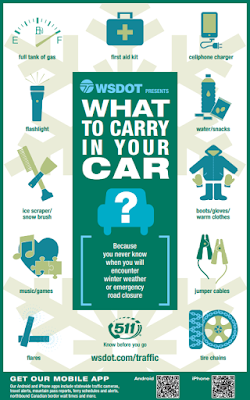 @wsdot: Will provide statewide updates and information. @wsdot_traffic: Updates for King and Snohomish counties. @wsdot_north: Updates for Skagit, Whatcom and Island counties. @wsdot_tacoma: Updates for Pierce, Thurston, Mason and Kitsap counties. @snoqualmiepass: Updates for the I-90 corridor from Snoqualmie Pass to eastern Washington. 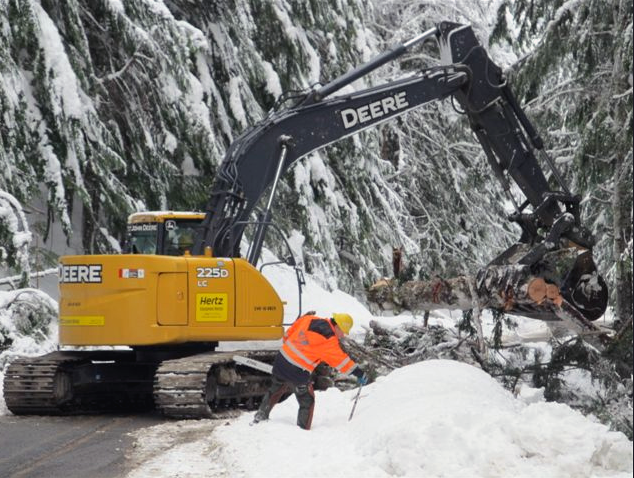 @wsdot_east: Updates for roads east of the Cascade Mountains. @wsferries: Updates on ferry service. 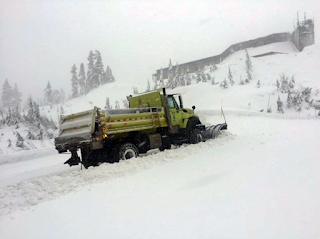 @wsdot_passes: Updates on pass conditions and traction requirements. The Washington State Patrol also has several Twitter accounts that are useful to learn about road conditions and get safe driving tips. The National Weather Service has accounts devoted to both Western and Eastern Washington and are good sources for staying up to date on forecasts. When using Twitter, be sure to check #wawx, #wasnow and #wintersafety to easily keep updated on conditions and updates on weather. We don't typically use Facebook for specific road condition updates unless it's a very serious incident/closure. Instead, it will be a convenient place to find stories and videos that include information about forecasts, winter travel safety tips and what we are doing to prepare for extreme weather. Videos to show you how to put on chains and drive for conditions. Our mountain pass reports so you know what the roads look like and what traction requirements are in place. Active travel alerts to plan for any road closures or other incidents that may be affecting your route. We encourage everyone to download our free app for their mobile device. You can find traffic maps, mountain pass reports, ferries information and travel alerts, among other resources. Information about traffic and weather on state highways is available by dialing 511. Messages are updated frequently, including mountain pass conditions and blocking incidents on highways. Our various Twitter accounts are a primary way we relay real-time road information to the public. While it may seem that more often than not, predictions of major snowfall don't pan out, it's always a good idea to be prepared and know where to turn for information before an emergency actually occurs. Because as soon as we let our guard down, that's when we'll find ourselves slipping and sliding all over the road. Protect yourself from those situations by getting ready now and knowing where to check if a big weather event does arrive. If you're not a skier or don't head over the mountain passes often, it's probably been awhile since you've seen a snowplow. But if predictions for this winter hold, you could soon spot the hulky vehicles on state roads. to putting down product such as sand and de-icer. Plows have already been hard at work over our passes and they're ready to go should the snow that we started to see fall on Monday, Dec. 5 warrant it. This time of year we inevitably get dozens of questions about snowplows. How do drivers train? Why do they plow when there's no snow on the roadway? What's the best way to pass them? I checked in with our veteran Enumclaw-based plow drivers to get some answers. How do they operate that thing? Learning how to drive a snowplow is a bit like learning how to drive a car. A really big car. New maintenance technicians sit in the passenger seat of a plow while an experienced driver is behind the wheel. The veteran drives a route and explains the operations from the cab, including how much salt, sand or other material to use. Then, the new technician trains in parking lots or on simple routes along mountain passes when snow starts falling in early winter. These are low-risk situations and take place in infrequently traveled areas. When the first big snowfall hits and groups of plows go out, it's usually the newest driver in the front so more experienced drivers can watch from behind and radio advice. How do they get ready for a big storm? In advance of a big forecasted storm, shop superintendents put crews on 12-hours shifts. Forecasts and temperatures are monitored closely and anti-icer is applied to roadways as indicated by the forecast, location and conditions. As the snow starts falling, plows work 24-7 to distribute the state's 169,000-plus tons of salt, sand or a salt/sand mix and more than 1.5 million gallons of liquid de-icer to the roads. How can I safely pass a plow? Short answer: Don't pass one. Plows are on the roadway to improve driving conditions. Snowplow drivers across the state can recount tales of speedy, impatient drivers blowing past only to spin out seconds later. Being behind a plow is often the safest place to be. Most plows work at speeds between 25-35 mph. This allows for the sand and salt to fall properly onto the roadway. This is plenty fast for drivers in snowy conditions. No waiting needed! If passing is a must, wait until the plow driver allows it. Often times, drivers will slow down and pull a bit to the side when there's cars behind them and conditions allow for passing. During an expansive lowland snow event, maintenance shops kick into high gear. Rest assured crews are working 24-7 to get roads clear. Crews rank the roads based on three levels of priority, and plow Level One priority roads first. High traffic routes such as Interstate 5 between Olympia and Seattle are prioritized, with less-traveled roads plowed later. Be patient. If it's a state road, we're likely coming to plow it. This road is bare, why are you plowing it? This depends. If snow is forecast and temperatures are below 35 degrees, the plows are likely spreading anti-icer as a preventative measure. Also, sometimes the road appears bare but there is actually a thin layer of slush. Lowland plows equipped with rubber plow rails are able to finely scrape the road for any remaining snow that could cause drivers to lose traction. How do I become a snowplow driver? Outside of some seasonal drivers hired to help Snoqualmie and other major mountain passes stay clear, the majority of our drivers are maintenance technicians. They're jack of all trade types who hop into plows when the white stuff starts falling. We recommend potential plow drivers have some experience with a CDL license and a decent knowledge of machinery. Most importantly, though, drivers need a calm demeanor. Driving snowplows is tense business. The weather, the control of heavy machinery and other drivers on the snowy roadway all account for a lot of stress. Individuals that remain calm under pressure make the best drivers. If you're interested in applying for a maintenance technician job, keep an eye on our job listings for openings. This time of year, we keep a close eye on the weather. But keeping up with forecasts can only do so much. Especially in our mountain passes, the weather is going to do whatever it's going to do. 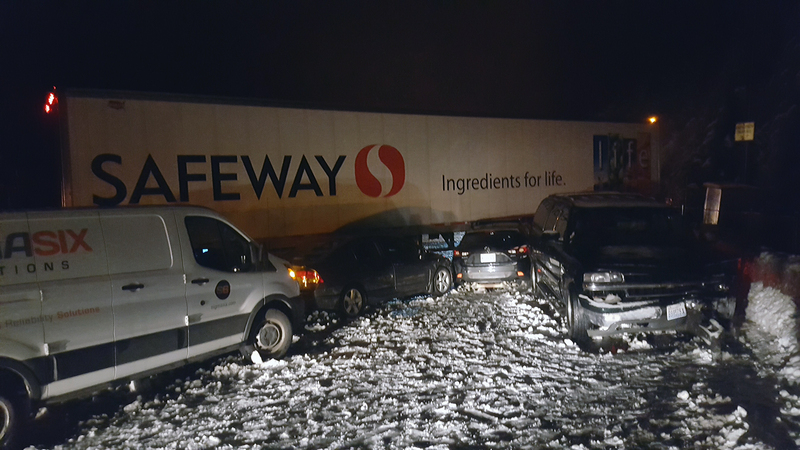 And that's what happened in the early evening of Wednesday, Nov. 30 when a sudden storm dropped about 4 inches of snow in an hour onto Interstate 90 over Snoqualmie Pass. While our crews worked to keep up with the weather, the traction requirements changed rapidly due to the road conditions, ultimately requiring all vehicles except all-wheel drive to chain-up. 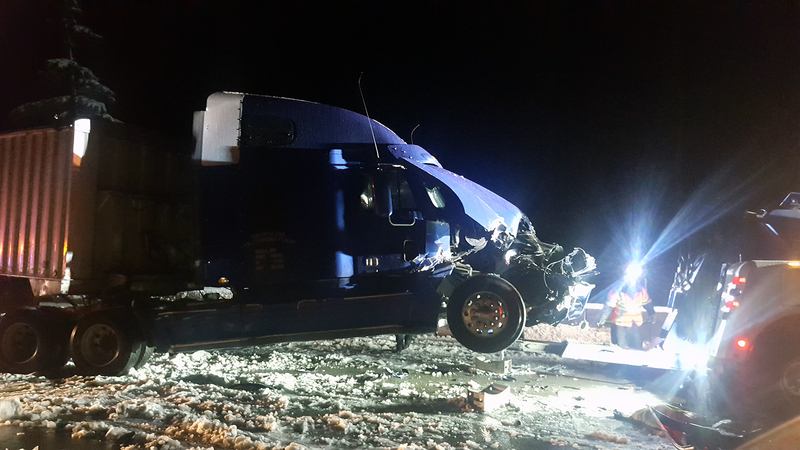 A chain reaction collision led to a 7-hour closure of westbound I-90 over Snoqualmie Pass this week. Unfortunately, some drivers ignored this requirement, resulting in multiple collisions that closed I-90 in both directions at 7:30 p.m. Eastbound reopened to traffic just after 10:30 p.m., but westbound didn't reopen until 2:30 a.m. That made for a long night for travelers and responding aid crews. All vehicles traveling over mountain passes need to be prepared. Carrying chains is always a good idea as conditions can change quickly and requirements may call for all vehicles to use them – even all-wheel drive. When faced with snow and ice on roadways, slow down and increase your distance between other vehicles. It's vital that everyone comply with traction requirements and the variable speed limits. Traction requirements are made collaboratively between the Washington State Patrol and our crews, and are based on current road conditions and the weather. They aren't suggestions, they are requirements and are made for the safety of everyone. leading to several collisions and a full closure of the highway. We all remember last winter. 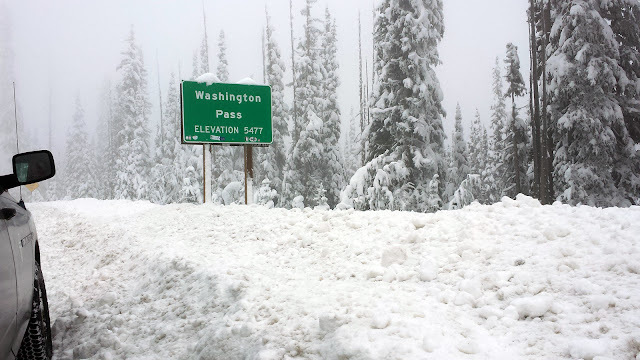 If it seemed like Snoqualmie Pass was closed a lot, well, it was! It was a record-breaking December up there, but what's interesting is that a majority of the closures weren't due to preventive avalanche control work; the closures were a result of collisions. And crashes on mountain passes can sometimes take hours to clear due to the severity, remote location, access to services, and limited space on the highway, especially at bridges. So please, have chains available and know how to put them on. Be sure your vehicle is equipped for winter travel because you never know how long you might be stuck in bad weather. Check conditions on the pass. And ultimately, please, drive for winter weather conditions, slow down, be cautious, give each other space and obey the traction requirements posted on the electronic message signs. Twice a year we play a waiting game involving - arguably - the most beautiful stretch of highway in Washington. That waiting game is over for 2016. The State Route 20 North Cascades Highway is closed for the winter. After temporarily closing the highway on Friday, Nov. 18 due to increased avalanche risk, we reevaluated the conditions on Monday morning and, combined with a forecast of increasingly rough weather later this week, decided to call it a season. The pass opened on April 22 after about a month of work by our crews clearing the roadway. This year's closing is almost a week later than in 2015, when we closed it on Nov. 16. 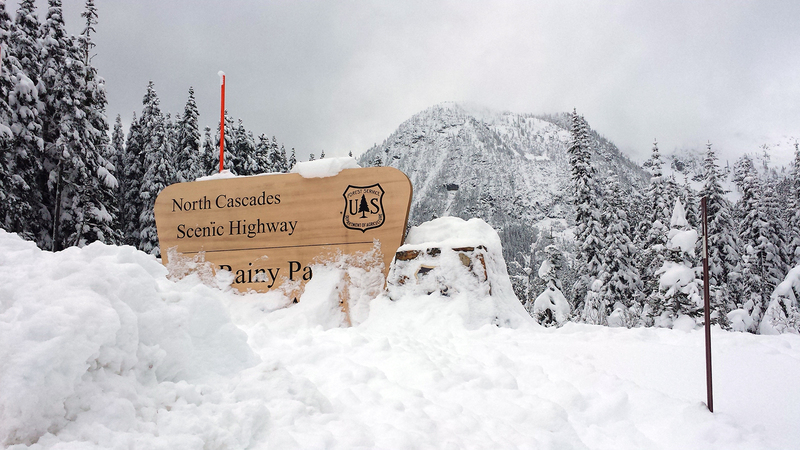 The SR 20 North Cascades Highway closed for the winter on Monday, Nov. 21. The SR 20 North Cascades Highway through North Cascade National Park connecting the Skagit River Valley and the Methow Valley offers travelers beautiful blue-green lakes, hairpin turns and jagged peaks during the summer months but some of those beautiful summer features turn dangerous in the winter. Avalanche chutes more than 2,000 feet long stretch along miles of this highway making it too dangerous to provide a safe highway all year. During the winter we close the highway and let the snow fall and avalanches slide down these steep chutes near Whistler Mountain, Washington Pass and Cutthroat Ridge. As soon as crews safely can, they'll start plowing this stretch of road in the spring. While it isn't safe to keep it open all year (always dependent on weather), we work to keep it open as long as we can and get it open again as early as we can so visitors and travelers can enjoy the National Park and the businesses that operate on both sides of the mountains. That said, the pass isn't closed to everyone. While licensed motor vehicles can no longer get through, back country skiers, snowshoers, snowmobilers and others can use the area year-round. But If you are out for winter adventuring while the highway is covered in snow, please be prepared and know conditions before you go. and others can still use it, but should be cautious heading to the pass. Want to be in the know during this waiting game? Sign up for our email list – Click on Traffic and Travel Updates -> Mountain Pass Conditions -> North Cascades Highway SR 20 -> and you'll get emails about clearing progress next spring and/or follow us on Twitter for photo updates as well. So for those who do love it, think snow! We'll be back with you in a few months as the waiting game begins again, this time for the opening date of this beautiful stretch of National Scenic Highway. The Thanksgiving holiday is a time for fun and relaxation, but holiday feasts can also present some tricky "high stakes" choices. Homemade or canned cranberry sauce? And don't forget Apple Cup the next day: Cougars or Huskies? The day before Thanksgiving is one of the busiest travel days of the year, especially on I-5 between Tacoma and Olympia. Thanksgiving weekend is a very busy travel day and significant congestion can be expected on most major routes throughout the state. A quick poll of co-workers and friends found some pretty strong – and unbending – feelings about each of these choices. And that's how it should be – it's what makes holiday traditions so special. holiday should be prepared for winter conditions. You also have choices to make when it comes to Thanksgiving travel. Stay close to home or head out of town? Leave early Wednesday or put it off until Thursday? And when should you head home to beat the worst of the traffic? We want to make sure you don't miss out on your favorite holiday tradition because you made the wrong travel choice, so here are some tips and tools to make sure no one starts eating without you. Know before you go. Our holiday travel charts help drivers plan trips around the most heavily congested travel times. Online tools further help plotting your trip and our mobile app, 5-1-1 travel alerts and social media such as Twitter and Facebook help you stay informed on the road. (Have a passenger check these once on the road, distracted driving is a sure way to ruin a holiday). Make sure both your vehicle and your passengers are prepared for winter travel. Carry chains, especially if traveling over passes. If traveling by ferry, leave extra time for holiday lines at the docks, consider purchasing tickets online and make reservations if traveling on the San Juan or Port Townsend/Coupeville routes. Some ferries run on Saturday schedules on holidays, check your route schedule before heading out. Check out the two extra trains WSDOT has added to its Amtrak Cascades routes for the holiday on Wednesday, Nov. 23 and Sunday, Nov. 27. Trains sell out quickly during holidays, so make reservations at www.amtrakcascades.com or 800-USA-RAIL as soon as you can. Know your tolls. The State Route 520 bridge will have weekend rates on Thanksgiving, returning to normal rates on Black Friday. On the Interstate 405 Express Toll Lanes, everyone travels for free on the holiday, returning to normal and HOV requirements on Friday. Weekends are always free in the I-405 lanes. Slow down: many pass and road closures are caused by vehicles spinning out or crashing, not the actual snow levels. Don't be the one driver who snarls traffic for everyone. This year's Apple Cup in Pullman on the Friday after Thanksgiving also presents several choices, especially with likely playoff and bowl invitations on the line. The 12:30 p.m. start doesn't leave much travel time between Thanksgiving meals and kickoff, making travel choices even more important. The Apple Cup the day after Thanksgiving will add even more traffic to I-90 and roads into Pullman. Will fans travel the night before or get up early the day of? Will true diehards try to have their Thanksgiving meal in the car this year? Plan your route and give yourself extra travel time. No matter which way you're heading, there are only a couple of ways into Pullman. Drivers should expect congestion on US 195 and SR 27 between Spokane and Pullman, plus SR 26 between Vantage and Colfax, both before and after the game. Be prepared for snow or ice on the passes – and check pass reports before heading out the door. A forecast calls for a series of strong fronts moving into the area on Thanksgiving and lasting through the weekend with snow levels falling which could lead to significant snow accumulation on the passes. High winds are also expected. Slow down. No game, not even the Apple Cup, is worth crashing or risking injury. Here's to a safe and stress-free holiday weekend and an exciting, hard-fought Apple Cup. In the market for a historic bridge? We have a deal for you! Update for Aug. 2, 2017: Good news! 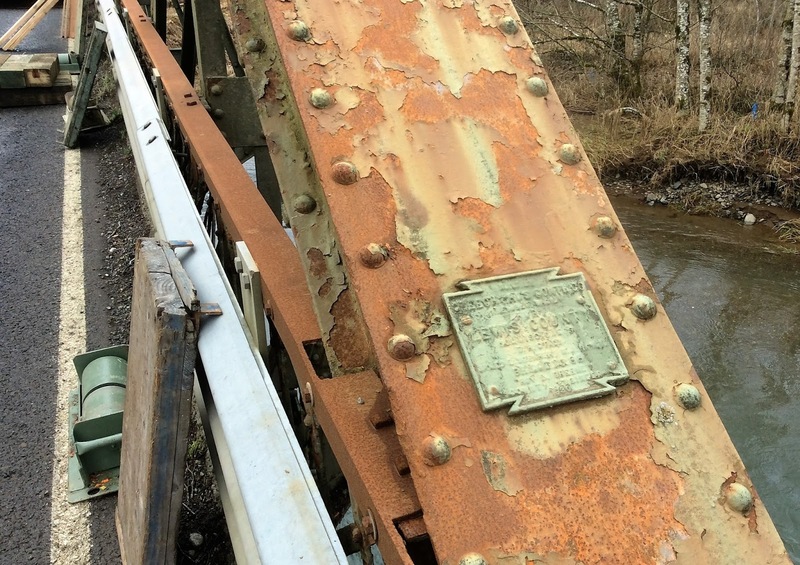 We may have found a new owner for the SR 508 Newaukum River Bridge. We received interest from several folks and organizations and ended up with one person who understands what it’ll take to own the structure. We’re now working together on agreements and how the bridge will be used to preserve its historic nature. The individual plans to keep the bridge in the Evergreen State. Looking for a memorable gift for that special someone who's hard to shop for? How about the State Route 508 South Fork Newaukum River Bridge? 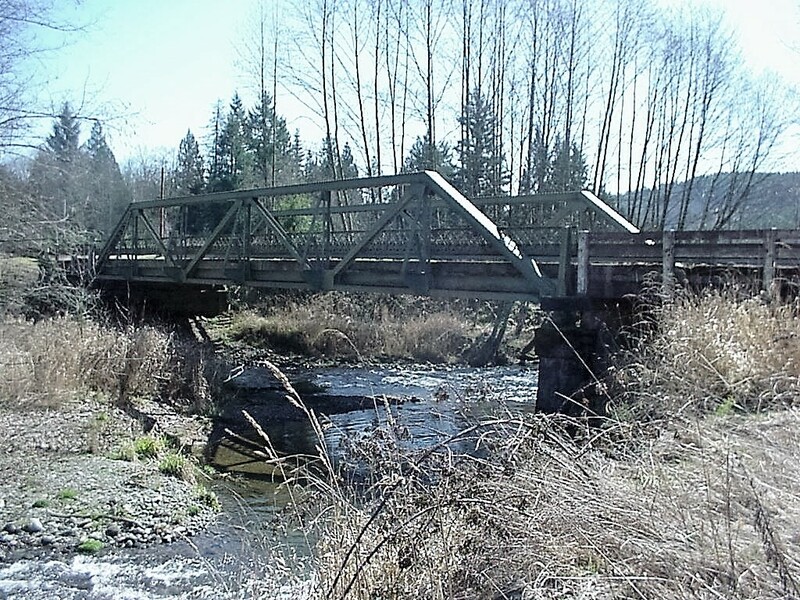 Located near Onalaska in Lewis County, it would make the perfect present for someone who has always wanted their own bridge, but didn’t know quite where to start. Sure, at a rusty 86 years old, the bridge is past its prime, but we like to think it’s full of character and charm. Also, because it is eligible for historic listing, the National Historic Preservation Act requires we market the bridge to find it a new home. So, what do you think? Does this sound like the right fit for you? During the first half of the 20th century, pony truss bridges like the Newaukum River Bridge were often used to span short distances. 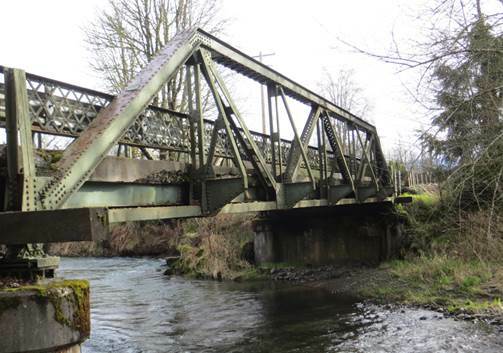 As concrete girder bridges gained in popularity, pony trusses have become relatively rare. The Newaukum River Bridge is one of only 13 pony truss bridges over 50 years old remaining on public roadways or recreation trails in Washington. 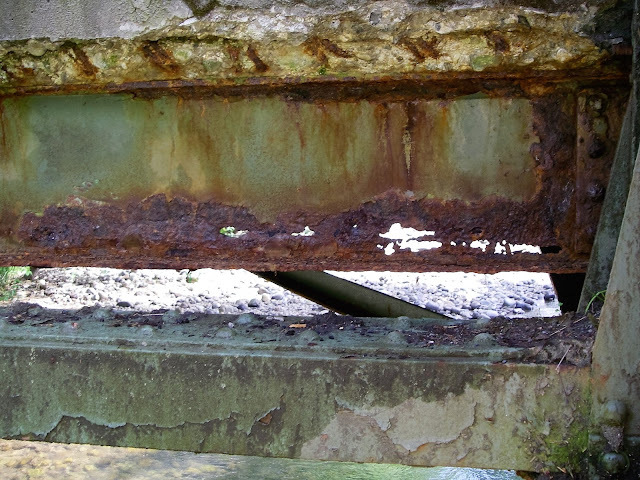 Rust has eaten through portions of the bridge. But time has finally caught up to the aging structure. Rust has completely eaten through portions of the bridge. 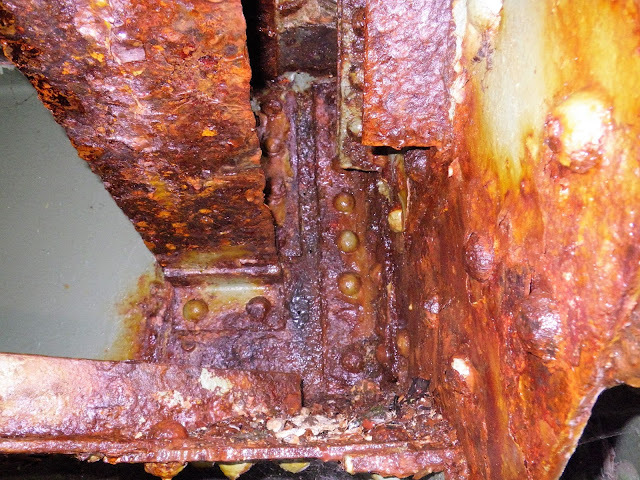 Following a January 2015 safety inspection, we closed the bridge because it could no-longer support heavy loads. WSDOT maintenance crews built a temporary single-lane Bailey bridge across the aging Newaukum River Bridge. About a week later, we assembled and installed a temporary Bailey bridge over the existing structure and reopened the road to serve the 1,400 drivers that use the route each day. Without the temporary bridge, drivers would be forced to take a detour, adding time to their travel. SR 508 South Fork Newaukum River Bridge, built in 1930. So, since the old bridge can no longer hold the weight of modern day traffic, what might be a good fit for it? We’re hoping someone can repurpose it at a golf course, on a hiking trail or even see its beauty as garden art. If you are looking for a unique way to preserve Washington’s history, relocating and restoring this historic bridge is for you! You’ll get two as-is riveted-steel 90-foot Warren pony trusses with verticals. They’re comprised of fabricated steel shapes, including channels, angles and plates. Sorry, the bridge deck and substructure aren’t included. Recycling this historic gem is no easy task. Moving and repurposing old bridges is expensive. Costs related to removing and relocating the trusses are up to you. If no one wants the old bridge, it’ll be demolished, but we don’t want that! We know there’s a home out there just waiting to welcome the structure into their family. Either way, the old bridge will be replaced with a new permanent structure made with concrete girders that’ll hold up better to the weight of heavy traffic, flooding and earthquakes. The new bridge is scheduled to open in 2018. So are you sold? Great! Contact us for more information. In the last year, we’ve seen big changes not only on I-405 with express toll lanes, but also the Puget Sound region as whole with more people living and working in the communities surrounding the I-405 corridor. The Puget Sound region is experiencing tremendous growth and a booming economy, in the last year the region experienced the biggest population gain this century and the highest growth rate in the past 20 years, and job growth is accelerating as well. Since 2000, when planning for the I-405 corridor was underway, population has increased a total of 23 percent and employment by 15 percent in King and Snohomish counties. As more people live and work here, more drivers are on the roads. While the express toll lanes have shown to be an effective tool to provide a more reliable trip, the tremendous growth in the region doesn’t change the fact that there is still limited capacity on our already congested highways. In September we provided a brief update based on trends over nine months. Now that we’ve got a full year data crunched, let’s take a deep dive into what the numbers are showing us. People are really showing us just how much they value the choice for a faster trip when they need it. Over the first year, people chose to pay a toll 10.1 million times plus another 4.4 million free trips in the express toll lanes for carpoolers and motorcycles. As new people move to the region, we continue to see new commuters in the express toll lanes each month. 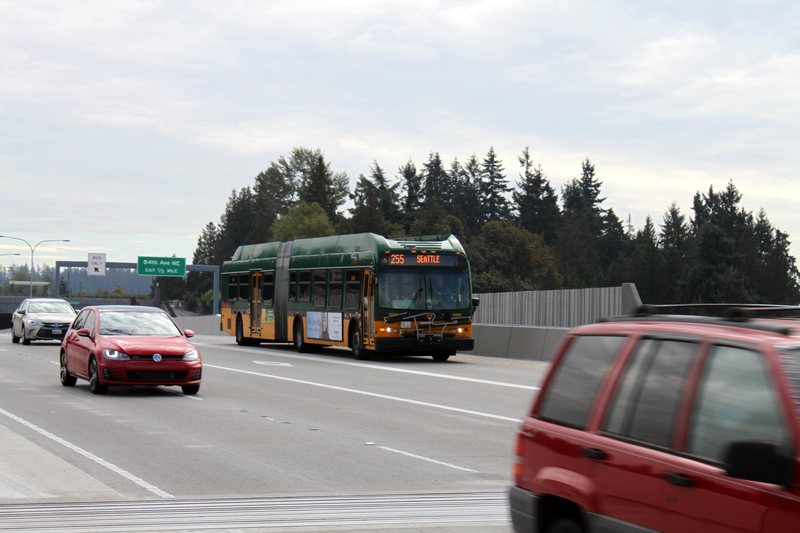 Even after one year, 50,000 new vehicles used the express toll lanes for the first time in September. Not only are drivers in the express toll lanes saving an average of 13 minutes over the general purpose lanes, we’re also seeing benefits for general purpose lane drivers in most sections of the I-405 corridor including shorter travel times. The exception is trips on northbound I-405, which travel between SR 522 and I-5, where capacity is limited as five lanes convert to three creating a bottleneck. We’re already moving forward with the first major improvement funded by tolling revenue, a new northbound peak-use lane from SR 527 to I-5 that will help reduce congestion in this area. Curious on the specifics of how your commute has changed? We looked at a lot of different trips, over different time periods, to see how travel times have been affected. In addition to faster speeds, we’re moving more vehicles through the corridor in the peak period. We’re moving 300-700 more vehicles per hour, per lane in the two express toll lanes compared to the previous HOV lane. Depending on the location, we’re moving up to 200-300 more vehicles per hour in the single express toll lane where no capacity was added compared to the previous HOV lane. We’ve also improved reliability for the express toll lane. When looking at the full corridor trip, the previous HOV lanes moved vehicles at 45 mph or faster 60 percent of the time. When averaged across both directions for the last six months, express toll lanes have improved the percentage of time speeds are meeting 45 mph by 25 percent compared to the HOV lane in 2015. Limited capacity. Capacity was not changed between Bothell and Lynnwood on I-405. The slower speeds in the single express toll lane have influenced whether the express toll lanes meet the 45 mph metric. Increasing demand. Significant regional growth has led to more drivers choosing to use the express toll lanes, therefore putting more strain on the single lane section. Drivers also made 6,000 more weekday peak period trips in the express toll lanes in September 2016 compared to October 2015. To improve performance, WSDOT is looking at a variety of operational improvements to address the capacity constraints on I-405 between Bothell and Lynnwood, including the northbound peak use shoulder. So, it’s hard to talk about the benefits of the express toll lanes this year without mentioning the revenue. We try to publish financial statements for all toll roads and bridges every three months to help you understand exactly where your toll dollar goes. If you want a refresher on how to read the financial statements, check out Dollars and sense: Breaking down the first I-405 express toll lanes financial report. $21.6 million in gross revenue: That’s how much money was raised from people making a choice to pay a toll for a faster trip in the express toll lanes. Of the total revenue, $17.5 million was from toll revenue and the rest from other revenues such as Good To Go! Pass sales. People have gained more control over their commute, and this revenue is an added bonus because once expenses are covered, the money will be reinvested back into the corridor. Following the money: How your toll dollars are being spent. 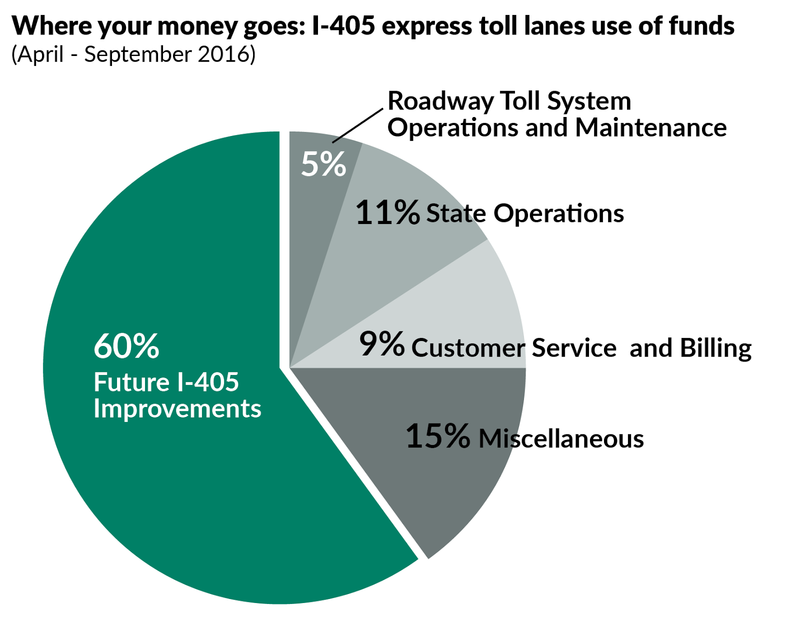 Over the past six months, 40 percent of the money raised on I-405 went towards toll collection. You might notice that the chart above is just for the last six months, not for the full year. This is what we expect operations costs to continue to look like in the future because our operations and maintenance costs were lower when the express toll lanes first opened. The roadway toll system operations and maintenance team received 5 percent of this revenue. This service is provided by a vendor from Rockville, Maryland. They have a core staff of six in Puget Sound. Their compensation is also not affected by traffic or toll rate levels. State operations costs amounted to 11 percent of the revenue. This includes our staff costs, consulting support, and staff related costs such as rent, phones and computers, data collection tools, reporting on performance, software and office supplies. Customer service and billing operations received 9 percent of the revenue in these statements. Both services are provided by a vendor from Richardson, Texas. They employ more than 120 people right here in the Puget Sound region. This vendor gets the same amount per transaction no matter what the toll rate is or how much congestion there is. 15 percent of this revenue went to miscellaneous operating costs including enforcement by Washington State Patrol, Good To Go! pass equipment and distribution, toll bill printing, postage, and civil penalty adjudication costs. You’ve likely seen them pushing a disabled vehicle to the shoulder, or cleaning up after a collision, or picking up debris in the middle of a highway. Being a member of our Incident Response Team is a challenging, dangerous job but one that is vitally important to keeping traffic moving safely. In 2014, IRT cleared more than 48,000 incidents in an average of just over 12 minutes. Recognizing the importance of everyone who responds to issues on the highway, the Federal Highway Administration declared that Nov. 14-18 is the first ever national Traffic Incident Response Awareness Week. Having done several ride-alongs with our IRT group, I’ve seen first-hand what it’s like for them on the highways, and it isn’t for the faint of heart. While they take every precaution they can to be safe, there’s no getting around the fact that their work often involves being outside of the relative safety of their vehicle while traffic zips by. Every one of our team members can recount dozens of close calls, including a very scary one on the I-90 bridge in September. so IRT’s response time is critical in keeping traffic moving. While IRT’s response is meaningful to each person they help, it also helps the entire highway system in a big way. According to our most recent corridor capacity report (pdf 9 mb), our IRT group responded to 48,691 incidents in 2014, and cleared them in an average time of 12 minutes, 12 seconds from the time they were first notified of the situation. Given that every minute that a lane is blocked results in up to 10 minutes of traffic congestion, that response time goes a long way in keeping traffic moving. The team’s assistance resulted in about $74.1 million in estimated savings to travelers and businesses by reducing idling time, late deliveries and helping to prevent secondary incidents. or clearing the roadway after major collisions. But we’ve said it before, and we’ll say it again: They need your help. Please slow down and give work crews as much room to work as possible. The safer they feel, the quicker they can help. If you can clear your vehicle to a shoulder or off the highway, please do. It’s typically safer and will make it easier for our crews to help you out. If you do need help getting off the highway, listen to IRT’s instructions and cooperate and they can get you to safety. IRT’s priority is to make sure you can get where you’re going as safely and quickly as possible. They take helping the traveling public seriously, and they do a great job. So we’re excited to have this week to raise awareness to their work, and offer them a big “Thanks” for all they do. As Henry Ford's groundbreaking Model T began rolling off a Detroit assembly line more than a century ago, the fledgling Washington State Highways Department set about transforming dirt wagon trails into our state's first network of modern roadways. Fast-forward to the 21st century, and the construction and maintenance of highways remains a core responsibility for the renamed Washington State Department of Transportation. But just as our communities have grown and diversified over the years, so too has our mission. The world’s longest floating bridge opened to traffic in April 2016. We are no longer just a "highways department." 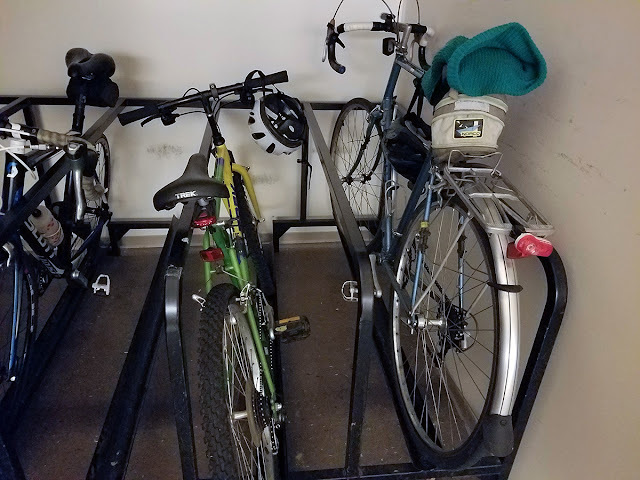 Today, we work to create and maintain a sustainable, integrated transportation system that supports multiple modes of travel, whether for driving solo, sharing a carpool, hauling freight, commuting by bus, taking a ferry, riding heavy or light rail, bicycling, or simply walking to your destination. 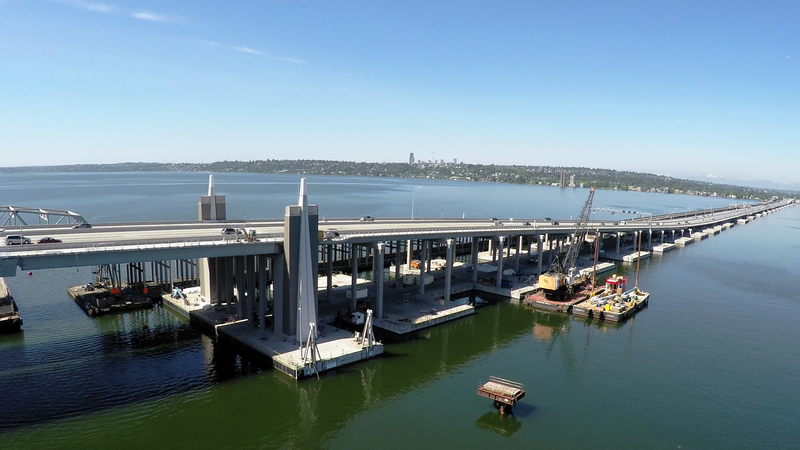 A prime example of our multimodal pursuit is the new State Route 520 floating bridge on Lake Washington and its connecting SR 520 corridors on both sides of the lake, between I-405 and I-5. The rebuilt highway – still a work in progress – demonstrates how interwoven strategies for moving people and goods can create more livable communities while supporting regional growth and economic vitality. 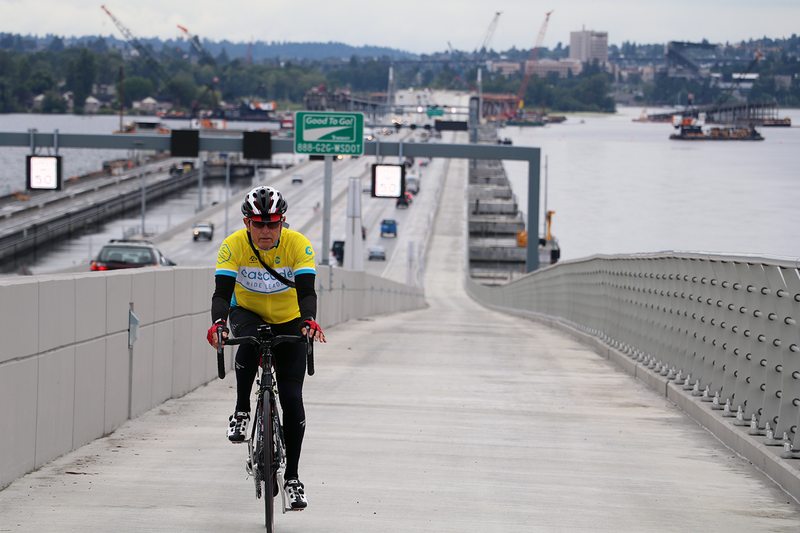 A bicyclist pedals on the new floating bridge’s 14-foot-wide shared-use path, which in 2017 will extend from Seattle to the Eastside. We are pleased to see the highway's improvements drawing positive reviews both regionally and nationally. 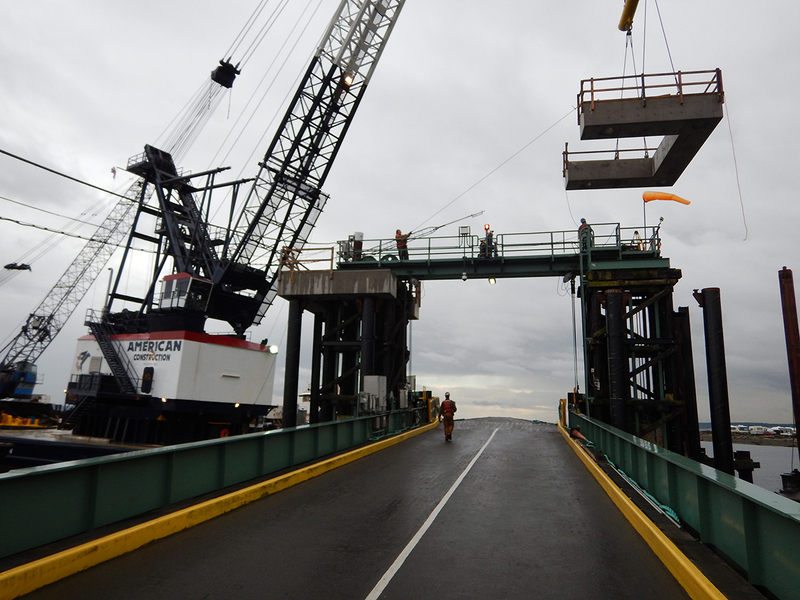 Last month, the Puget Sound Regional Council gave us a Vision 2040 Award for completion of the new floating bridge, citing the structure's role in helping to "ensure a sustainable future as the region grows." 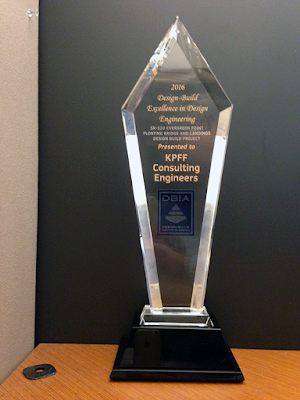 And in early November, the bridge project earned the national 2016 Excellence in Design (Engineering) Award from the Design-Build Institute of America. Meanwhile, the highway's completed Eastside segment, from Medina to I-405, won a 2016 Quality of Life / Community Development Award from the American Association of State Highway Transportation Officials. We'll find out in mid-November if our Eastside project is the association's national Grand Prize winner for state highway projects. of America this year for work on the SR 520 bridge. Bigger, stronger pontoons, anchors and anchor cables for the new floating bridge – it opened last spring – that enable the bridge to withstand much stronger winds and waves. Replacement of the highway's structurally vulnerable, hollow-column approach bridges with new, solid-column bridges built to modern seismic standards. The addition of bus/carpool lanes in both directions to improve transit safety and trip reliability. Five landscaped, community-connecting lids over the highway, three with direct-access transit stops and better, safer transit connections for bicyclists and pedestrians. A regional, cross-lake bicycle and pedestrian path from Seattle to Redmond, with numerous connections to local shared-use trails. Full shoulders so disabled vehicles will no longer block the SR 520 mainline and snarl traffic. An engineered floating-bridge design that will accommodate a retrofit for light rail should the region's voters someday choose that option. Improving traffic mobility was, of course, one priority for a reconstructed SR 520. Traffic studies predict that when the highway is fully built out to I-5, HOV travel time from Seattle to Bellevue will be 25 minutes shorter during peak periods, and 31 minutes shorter in the general-purpose lanes. A bus enters the HOV lane on the new SR 520 floating bridge. The improved highway also reflects the public's desire for a more environmentally friendly transportation system. 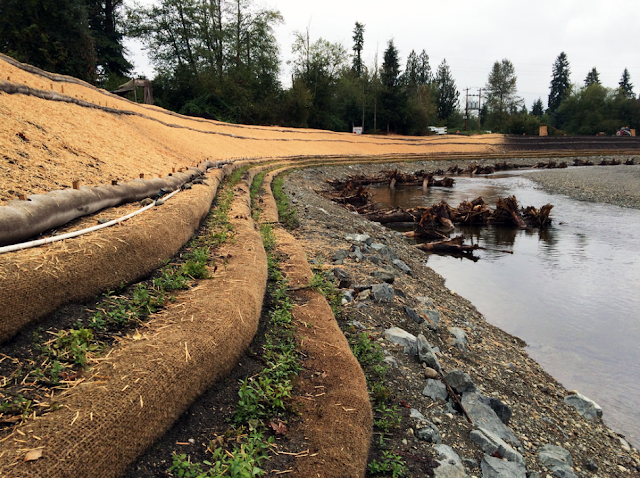 For the first time, SR 520 runoff and the pollutants it carries will be captured and filtered, either in on-land stormwater-detention sites in Seattle and the Eastside, or in innovative catch basins and stormwater lagoons constructed on the new floating bridge. Project accolades from industry peers are nice, I'll admit. But much more rewarding for me and my colleagues is the personal conviction that, day by day, year by year, we're designing and building smartly integrated, sustainable public infrastructure – infrastructure that will benefit our neighbors and the communities we share for generations to come. That is the road we're taking. And the journey continues. It’s that time of year in the Pacific Northwest, when the rain is a frequent companion on the roads and the days are getting shorter. That means on my 45 – 50-minute bike commute, I could be riding to work and home in the dark, and arrive a little soaked. There’s only so much I can do on the streets to be seen and be safe. I have my reflective clothing, a bright headlight, a flashing red light behind, and I focus on riding defensively. All of these steps help add visibility, but it takes two to tango, which means all users of the road need to watch out for one another to avoid a potential injury or worse. I find myself riding slower in the dark. Seeing other people and other objects in low-light conditions is tough for anyone. For people behind the wheel, they need to be able to perceive what they are seeing and recognize the importance of a pedestrian or bike rider in order to take action. This could mean stopping for someone crossing the street or giving a rider at least three feet. According to the Washington State Strategic Highway Safety Plan 2016, 69 percent of pedestrian-related crashes happen during the nighttime hours or dusk. Nationwide, there is an increase in pedestrian fatalities in the fall and winter months. For cyclists, those numbers also track seasonally with a spike during nighttime hours in fall and winter. Having good reflectors or lights can help keep bike riders and pedestrians safe in the dark. Visibility is key. For people pounding the pavement or those like me who use pedal-power, wearing bright and reflective clothing, and flashing red tail lights helps us stand out. It’s also important to be predictable and clear on your intent to other users of the road. If you’re on foot, make it clear to on-coming traffic that you’re about to step off the curb. When I’m on my bike, I use hand signals ahead of turns, stops and lane changes. Intersections and crossings are a common vehicle/bicycle crash location, resulting in 72 percent of all serious reported cycling injuries. While I’m on a ride, if I see a vehicle about to turn right at an adjacent stop sign or at a light while I’m heading straight, I try to make eye contact with the driver, and even give a wave to make sure I’m seen. I usually get a smile and wave in return. Besides avoiding a collision, we help make the road a friendlier and safer place. 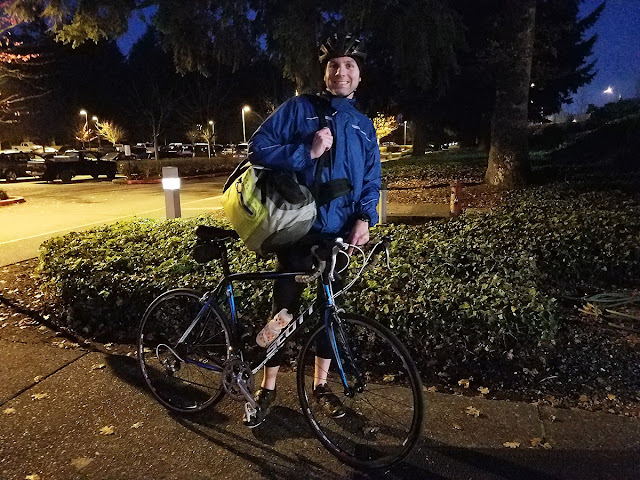 If you’re walking or riding at night, it helps to know your route so you can focus on the other variables such as traffic, instead of trying to navigate on the fly. If you want to start walking or riding, make a couple trial runs during daylight hours on the weekend. It also helps to let your family and coworkers know where and when you will be on the road walking or riding. I always let my wife know when I get to work, and when I start my trip home. It’s peace of mind for her, and she can pick me up if I get stuck. be known to others and check in with friends/family to let them know your plan. When I see people behind the wheel on their phone, or with earbuds in while they are riding, I cringe. I don’t have a lot of confidence that those folks are focused on their safety or mine. Distractions such as electronic devices should be packed away until you’re out of traffic, period. Impairments such as alcohol and drugs have been a known factor for both bicycle and pedestrian fatalities. In Washington, 16 percent of fatal bike collisions were attributed to driver impairment; 21 percent were attributed to rider impairment. Need to get home after a night out? Snag a ride with someone else – there are plenty of options. Regardless of how you roll, we all have places to go during the dark days of fall and winter. Wherever your final destination may be, usually there’s someone depending on you to arrive safely. Just remember that other folks are out there trying to do the same thing. Do you regularly take the ferry between Whidbey Island and the Olympic Peninsula? It's a beautiful trip, but you may want to make other plans on Nov. 5 and 6. On those two days, the Coupeville ferry terminal will be temporarily closed for some earthquake retrofitting work. The work will start after the last sailing on Friday, Nov. 4, and last until after the last sailing of the day on Sunday, Nov. 6. With just one slip at the Coupeville terminal, it's impossible to maintain service during this weekend's work. The Coupeville ferry terminal will be closed Nov. 5-6 for seismic retrofitting work. The Coupeville to Port Townsend route provides an essential link and an exceptional shortcut between the Olympic Peninsula and Whidbey Island; turning what would be, at best, a 4½-hour drive into a scenic one-hour ferry trip. The 40-year-old existing structural towers that raise and lower the moveable bridge between the ferry and the Coupeville dock are made of wood and could be damaged during an earthquake. We need to try to fix that so we can keep the route safe for the 787,391 people who use it every year. the two towers will be removed and then put back into place this weekend. 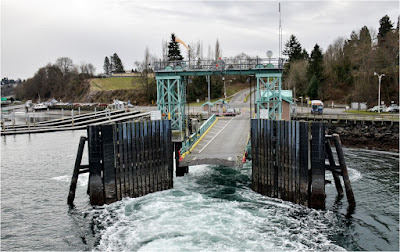 Unlike most of our ferry terminals, Coupeville only has only one slip - with only one moveable transfer span, our name for the bridge to get cars and people on and off the boat. Since last September we've been strengthening its old support columns with unshakable steel beams and piles with no loss of ferry service. 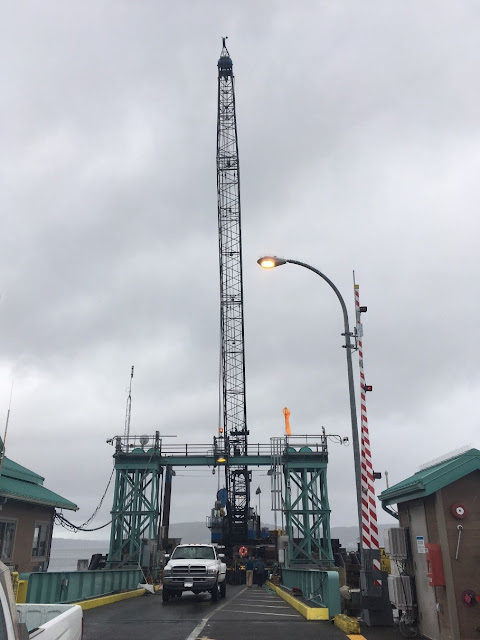 However, this last phase of work requires us to temporarily dis-assemble the transfer span towers, making it impossible to support ferry service on the Port Townsend/Coupeville route. Timber piles that are not seismically retrofitted remain vulnerable and could collapse during a major earthquake. This project, similar to the recent seismic retrofit work at Vashon terminal (above), helps maintain vehicle and pedestrian access between the ferryboat and the terminal in the event of an earthquake. The tricky part is getting access to the horizontal connector frame connecting the two towers. This weekend, crews will work from a barge to remove the horizontal frame, add steel to the recently installed huge concrete caps on the tops of the towers and then re-strap the connector frame atop the sturdier concrete caps. This way when the ground starts shaking, the headframe and towers have a better chance at staying connected as one unit instead of splintering and crashing to pieces. to the top of the vehicle transfer span towers at Coupeville terminal. There's never a good time to suspend service on a ferry route, however closing the route around the clock for a weekend allows us to complete these necessary safety repairs outside of the work week, and in time for Veteran's Day travel. When the Port Townsend/Coupeville route is closed, customers are encouraged to use the Edmonds/Kingston, Mukilteo/Clinton and Seattle/Bainbridge ferries as alternate routes. Customers traveling on those routes should expect longer wait times due to the extra traffic all routes will likely absorb during the Coupeville terminal closure. WSF will update Twitter and send ferry travel alerts with wait-time information throughout the weekend. Because there will be no ferry service on Saturday, Nov. 5, and Sunday, Nov. 6, vehicle reservations have been suspended for travel out of an abundance of caution, reservations also are suspended for Monday, Nov. 7 in case severe weather or unplanned construction delays require work to extend past Sunday night. We know this closure is going to present a challenge for many of you. It's a difficult task balancing work needs with the needs of travelers. We appreciate your patience and cooperation as we get these critical safety upgrades done. In early October, Maintenance Superintendent Mark Renshaw got a call he's fielded dozens of times before. Trees were down on State Route 20, east of Marblemount. The road was blocked in both directions and we need crews out there ASAP. can remove a tree like this one on SR 20 near Marblemount. In this case, the incident was pretty routine and we got the road opened up relatively quickly. But that isn't always the case. 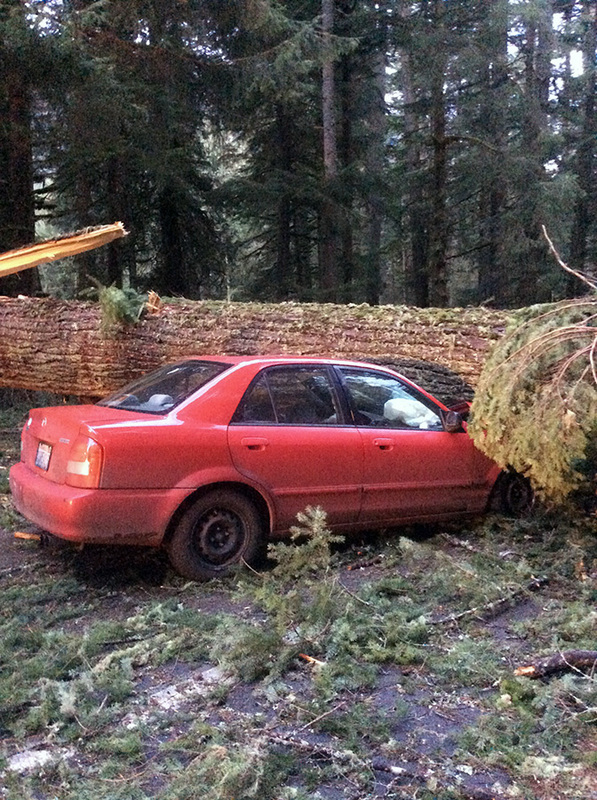 Our maintenance crews often handle land slides and hazardous or downed trees but storm-related road closures can be a rare sight for many drivers. So when a big storm does hit, people wonder why it takes so long to re-open the road. The first step when our crews arrive on scene of a downed or leaning tree is evaluating the potential for danger, both to workers and the traveling public. 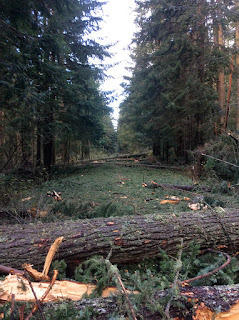 Are trees still actively falling in the area? Is a tree leaning and presenting a threat to the roadway? If so, we'll close the road until we can be sure everything is safe for drivers. A major safety concern when it comes to hazardous trees is the potential for contact with utility lines. If a damaged tree has contact with lines, crews from that utility come in and make sure the line is shut off. 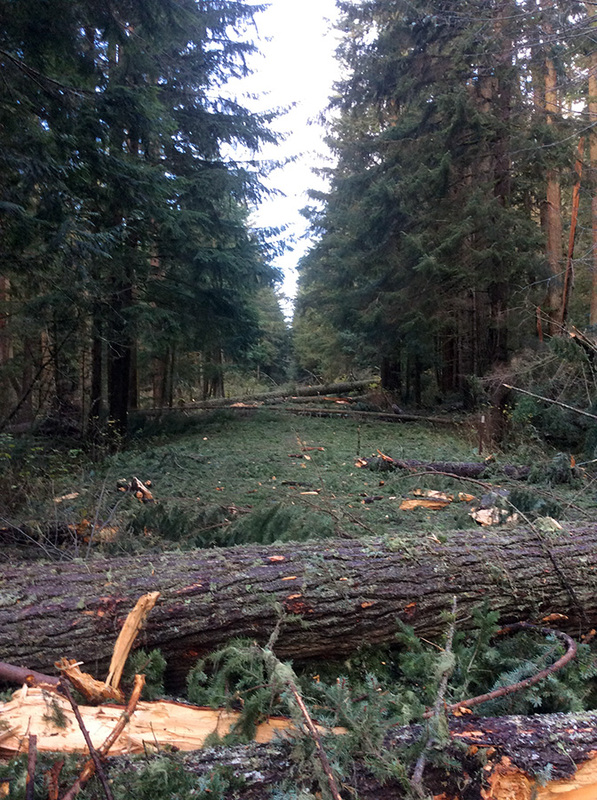 Since the Hanukkah Eve Windstorm of 2006 knocked out power to 1.2 million people in the state, our working relationship with companies like Puget Sound Energy and Seattle City Light has grown stronger and more collaborative. Together, we have helped streamline the process of opening roads. There's a protocol in place, and if a tree is touching the wire, we call the power companies to address that situation before our crews move in. The Mt. Baker Highway in Whatcom County was covered by more than 100 trees in Dec. 2012. Even if there are no lines in the branches, sometimes the way a tree is leaning can prohibit work. The Department of Labor and Industries requires some work be done during hours of "no shadows." Depending on the scope of the situation and potential safety threat, we may not be able to cut the tree at night. 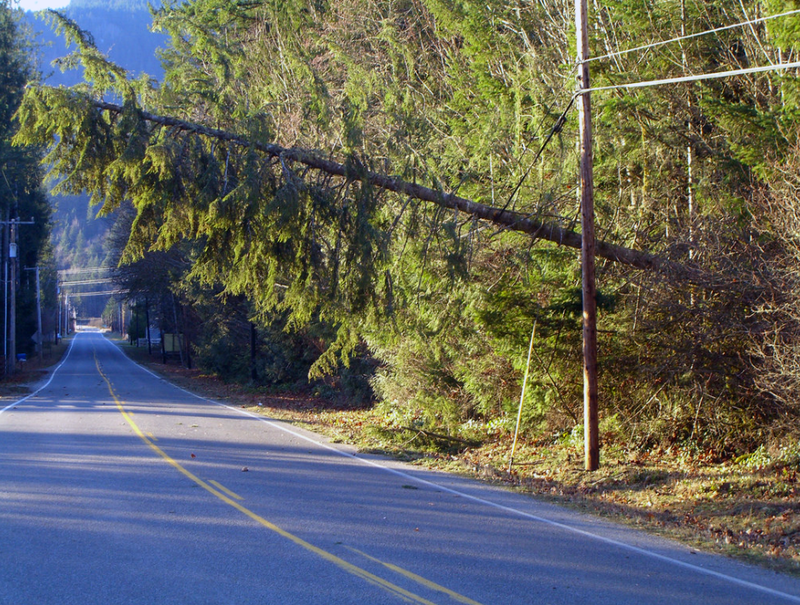 During a big storm, our relationship with the power companies can also determine where and when certain roadways open. For instance, say a big windstorm means trees are down on both Interstate 5 in Everett and SR 9 near Snohomish. Many would assume we'd clear the trees along the busier roadway first. But since more power lines run along SR 9, it may be a higher priority to clear those trees in order to restore power to thousands. A smooth trip on the interstate is great, but arriving home to no power would be a bummer. It's a balance and requires coordination and teamwork to prioritize which roads are opened and in what order. While we're busy clearing roads and our partners are restoring power, you can help with the process. When you encounter a "Road Closed" sign, it's crucial to abide by the law even if the closure appears small. The signs are there for a reason. 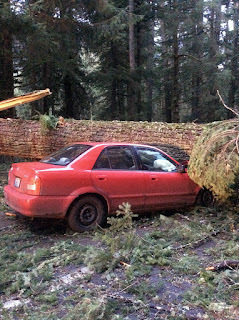 During a closure in 2015, a young driver went through a closed section of SR 410, thinking it was just one tree to go around. Instead, there were dozens. Have you ever seen pickup sticks? That's what the roadway looked like, but the grown-up version. The teen missed the first tree, but slammed into one further down the road. He was OK, but his father was none too happy and the crash further delayed the road opening. If a road is closed, there's a reason for it and that reason is almost always about safety. Clearing roads after storms can take time and while we try to do it as quickly as possible, keeping everyone safe is always the most important factor. So abide by the signs and if you're driving near crews responding to incidents, slow down and give them space to work. We may have avoided the brunt of what was forecast to be a huge storm early this month, but indications are that this could be a wet, windy winter season. Renshaw and his crews, like all of our maintenance staff across the state, are gearing up and preparing to respond. During these months we have maintenance crews ready all day, every day, many working 12-hour shifts to help keep roads clear and the public safe. With coordination with our partner agencies and your help, we'll be able to keep traffic moving and people safe come rain, wind, snow or ice.